I picked up a few jersey knit dresses to wear in the summer, I got one in black, one in green and one in lavender. I found that I would pull the black or green dresses out of the closet over the lavender one. Every time. I like the other ones when I’m wearing them, but not this one. Maybe it’s the lighter color? Anyway, this one has been in the refashion pile for awhile. Since I’m apparently not a fan of sleeves (Exhibit A. Exhibit B. ), I removed the sleeves. I had a general idea of what I wanted to do with the dress so I put it on Sally and surveyed the situation to see if it’d be possible. I played with the elastic waistline that used to fall at my natural waist and confirm that I could indeed make it an empire so I also took a seam ripper to the binding on the neckline. Next I stitched down the raw seams at the arms. Then I folded over the top edge on the front an back and threaded the old sash/belt through. The original plan was to tie it off at the sides. I decided that the tie would work best in the middle to keep from pulling the back off center. So I cut about halfway down to the waistline in the middle of the back and secured the edges. I stitched down the top edges, threaded the old sash through and ditched the old belt loops. They really wanted to be in the after picture! I now have a comfortable summer dress. With the tie in the back, I can easily throw on light sweater and wear it to work. Last week I shared a story on my Facebook page that one of my favorite refashion bloggers had posted a link to. It was about a woman who inhaled a pin accidentally and the need to have a piece of her lung removed to remove the pin. It was a frightening tale and it made me vow to stop holding pins (and needles) in my mouth while sewing. This is a bad habit and as I was working on this dress I kept finding myself going to hold the pins in my mouth. It’s a horrible habit that I need to break and that has become sewing goal #1. If you are in the same habit, try to break it because swallowing or inhaling these things is really dangerous and can happen very easily. 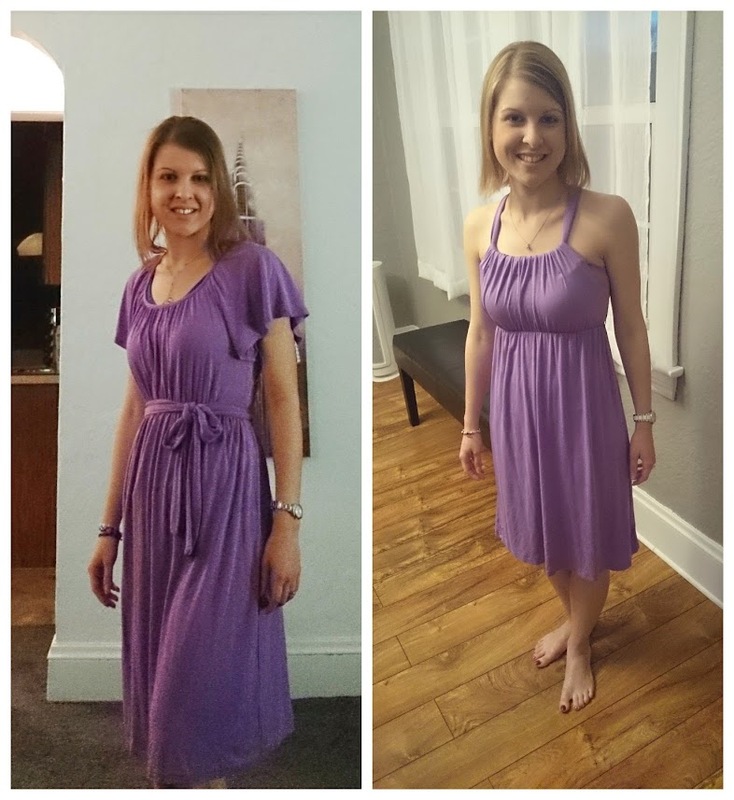 This entry was posted in Crafty, Refashions and tagged bad habits, dress refashion, lavender refashion, refashion, sewing, sun dress by Rachel. Bookmark the permalink. Super cute, I like it so much better now! That dress looks amazing! What a transformation! Great job! Amazing! I wish I could alter clothes like this. You made it look/sound so easy. Looks really awesome!